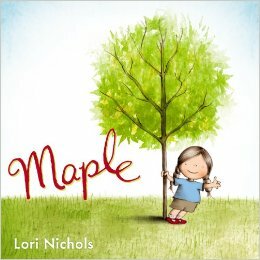 I know of plenty of girls/women named for flowers, but can't think of any who are named after a tree, but in this lovely book we meet the very sweet Maple - her parents do consider various other lovely names, but Maple it is, to match the tree they planted when she 'was still a whisper'. Maple grows along with her tree, singing and dancing to it, trying to keep it warm in winter, playing games. I particularly loved the small image showing Maple standing in the tree yoga pose. She does wonder if a friend who wasn't a tree would be a good idea and obvious resolution to the story comes when a new tiny tree grows... along with a new family member. Maple and her tree also become very good at keeping baby Willow happy. Very charming. Maple is a round-faced ball of energy. The illustrations (created in pencil on mylar then scanned and digitally coloured) include leaf rubbings from a real maple tree int glorious autumnal colours and fresh spring greens, also conveying the lovely dappled light a deciduous tree provides. The child reader will hardly notice that they are learning - finding out about seasons, and what happens to deciduous trees in winter, and that their family might change as time passes. Maple has already garnered a couple of awards - one interesting award I hadn't heard of before is the Giverny Award for analysing and improving biology instruction. They complimented Maple on its accuracy in depicting the growth and seasonal changes of the tree and the wider ecosystem - birds nesting and the phase changes of water. The picture book is such a perfect vehicle for teaching children about science, so much potential. You can download a very lovely activity sheet from the author's website to extend reading into activity. And finally, here is the rather lovely trailer for the book with banjo accompaniment!